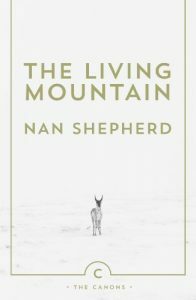 Nan Shepherd’s The Living Mountain is the final book in my reading series, and what a beautiful book it was: a tremendous testament not just to the Cairngorm mountain range but to humanity’s connection to mountains, wilderness and the outdoors in general. I confess, however, that I am a tiny bit disappointed, and should get two negatives out of the way first. Firstly, I am a little bit disappointed in myself due to a lack of clarity about the definition of travel writing, as I predicted somewhat in the preview. This book is, primarily, nature writing – writing about a place and the wildlife, atmosphere, weather and almost ethereal, spiritual sense of it, and the impact the place and people have on each other. Now, that’s not travel writing and, as I will say more fully in my forthcoming concluding piece to wrap up this series, it’s one of the difficulties inherent in a project about reading travel writing in that’s it’s a hard genre to contain. That said, there is an element of travel in The Living Mountain. This isn’t only a descriptive documentary about a location. Much of the rich character of the book comes from Nan Shepherd’s own stories of her hikes and journeys across the Cairngorms in the first half of the twentieth century, her walks both long and short, the people she meets and things she sees. Those bits most definitely are travel writing – even if they’re all within one (relatively) contained location. The second thing that slightly disappointed me was that the book, while superb, didn’t quite live up to the hype I had heard about it from various quarters (including the introduction written by Robert Macfarlane, which I refer to in my preview). Admittedly, most of the praise I’ve seen has come from outdoors/nature writers like Macfarlane, so I’m obviously coming from a slightly different angle, but the book was not for me quite the peerless masterpiece it is made out to be. Excellent? Undoubtedly. beautiful? Certainly. Among the best books I’ve ever read? Not quite. How much of that is due to the travel writing issue I mentioned above, I am not sure, but I hope the remainder of my review will convey my thoughts. What really stood out for me as a refreshing contrast from most of the rest of this year’s reading was the personal relevance of The Living Mountain. The Cairngorms about which Shepherd writes are more or less just down the road from me and I have been there countless times (most recently, just last week). There are so many beautiful spots, from mountains to lochs, forests to rivers, all worth exploring, and Shepherd takes them all in (albeit majoring on the mountains). The place names, even individual spots, were often known to me, and there was a reassuring familiarity in her frequent use of both Scots and Gaelic (there is a helpful glossary at the end). She writes elsewhere on related themes of the use of cleared land for deer, the conflict between using the Cairngorms as both workplace and playground, and the perceived selfishness of winter climbing due to the risks to rescuers. This all adds up to a book that, though obviously focussed on nature, has a strong social and human element to it, which helps make the narrative more real to me. Another thing I love is that, even though Shepherd structures the book in twelve themed chapters, many of the aspects of the book run through them all like a thickly woven rope. Beyond the issue of development versus wilderness I’ve just touched on, she sets out many wonderful themes early on in the book that are regularly revisited – the severe challenges but immense joys of exploring such a place; the natural elements, the interconnectedness of people with their surroundings; darkness and light; and the senses. And although that’s not exactly a ranting manifesto for the liberation of women to enjoy the natural environment, it at least contributes to an undercurrent of comment from the author that not everyone can, due to their domestic responsibilities, get out as much as they might. Indeed, Shepherd herself fails on gender grounds regularly, talking about the impact of humanity on the landscape as merely “men” (which, I suppose, is accurate in terms of who it is who’s getting out there, but too often an old-fashioned and annoyingly gender-neutral use of “Man” which belongs more in the annals of Tolkien). Once, our ghostly mentor held us each firmly by an arm and said, “That’s Loch Etchachan down there.” Nothing. The whiteness was perhaps thicker. It was horrible to stand and stare into that pot of whiteness. The path went on. And now to the side of us there was a ghastlier white, spreading and swallowing even the grey-brown earth our minds had stood on. We had come to the snow. A white as of non-life. Storm in the air awakes the hidden fires – lightning, the electric flickers we call fire flauchts, and the Aurora Borealis. Under these alien lights the mountains are remote. They withdraw in the darkness. For even in a night that has neither moon nor stars the mountain can still be seen. The sky cannot be wholly dark. In the most overcast night it is much lighter than the earth; and even the highest hills seem low against the immense night sky. A flash of lighning will draw them close for a brief moment out of this remoteness. The Living Mountain is not a long book. Weighing in at one hundred pages, the twelve chapters are each easily digestible in one sitting, and exist as powerful essays on their separate focusses. As such, extracting powerful examples of prose is hard due to the way Shepherd’s writing weaves thickly through the pages. It makes for a book that is inspiring and hard to put down, and a marvellous example of what one woman – writing in the 1940s, let’s not forget – can achieve in exploring and understanding her local area. While others will rave about this book better and more deeply than I, it’s undeniably a cracking and rewarding read. For those who do not know the Cairngorms it is both a great introduction to the region and a good general motivator to explore the natural world wherever you are. But for those who know the Cairngorms at least somewhat, as I do, there is something special in its infectious enthusiasm for the area that demonstrates that, however well you know a place, there is always deeper to dig and more to see.